Navigate through the crowds to discover Art Nouveau architecture that somehow survived, vibrant Jewish history & an insane amount of commerce… a side of Buenos Aires often overlooked. This guided walk covers 12 blocks & highlights the most important sites of a mini-neighborhood known as Once (pronounced OHN-say). Nestled within a district officially known as Balvanera, a single street serves as the axis for a stroll through the heart of central Buenos Aires. Buildings by some of the best Art Nouveau architects in the city are a focus of the walk. Compare the styles of Virginio Colombo, Julián García Núñez & Mario Palanti while learning about conservation efforts & how Once surprisingly became a center for Art Nouveau. Immigration is another main topic featured in this guide. Once is one of the most multicultural areas in Buenos Aires where Jews, Koreans, Bolivians & Africans work & live together. In a city that prides itself on being so European, this walk presents a very different & exciting view of the city. Finally, commerce & transportation can’t be ignored in Once… they give the area a buzz that defines the neighborhood. Learn about the oldest train service in the nation, how it helped trade grow in Once, & how things are organized today. Two detailed maps are included: one for the main walk along Calle Paso plus a second map that zooms in on Plaza de Miserere at the end of the walk. The plaza may be a bit of an urban mess, but nearby is the café where rock nacional began. Also bordering the plaza is the tragic site of a 2004 nightclub fire which killed 194 people & wounded over 1,400. They are never forgotten thanks to an interesting memorial. The following blog post discusses the area in more detail: Why Once? Format: PDF, A4 landscape, 27 pages. Ideal for viewing on any tablet or for print. Released Nov 2011, updated Feb 2015. This guide may not be redistributed, resold or reprinted. Duration: The route takes about 90 minutes to walk at a leisurely pace. You may need extra time to gaze at all the architecture & take photos. Price: US $4.99 via PayPal. A link to download the PDF will be sent to your email address after payment is confirmed. Unsure if this guide is for you? Not a problem. 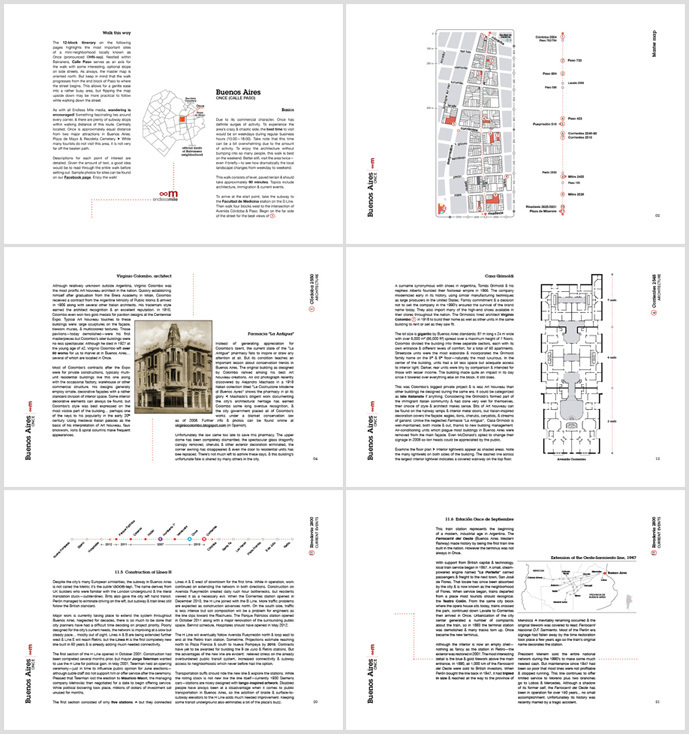 We’ve made our guide to DOMES OF BUENOS AIRES available for download free of charge! This 12-page, map-based PDF (only 2 Mb) allows you to examine the general structure, layout & writing style of all Endless Mile guides. Plus you’ll have an opportunity to discover 75 great domes in Buenos Aires as well! Some features you’ll find are: a brief historical background, a summary of architectural styles & lots of original artwork. Enjoy another way to explore Buenos Aires… on us!